Apple color coordinates the available clock faces with the color of the device. You get two simple analog versions (one mostly white, the other mostly the nano's color); a simple digital version; one with a techie looking dot matrix display; one that displays three time zones (with selectable cities) and one with huge numbers. There are similarly four device color coordinated "wallpaper" options, along with a basic grey or white background. It doesn't appear that you can use your own photo as a Home screen background. Bluetooth is off by default in Settings, but is easy to activate and pair with your wireless headphones, speakers or your car's audio system. You can set the user interface to any of 35 languages, and VoiceOver supports 29. Nike + supports seven: Chinese (Mandarin), English, French, German, Italian, Japanese and Spanish. VoiceOver supports pretty incredible voice-feedback for navigating the screen without looking at it. Hold the playback button down and VoiceOver will also announce the details of the song you're listening to. 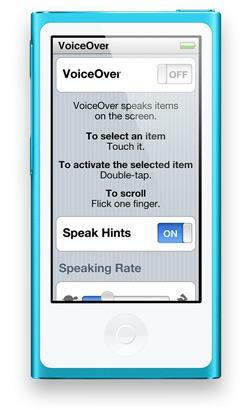 Apple's exceptional accessibility features make the iPod nano a capable tool regardless of one's physical impairments. As with previous non-iOS iPods, the newest iPod nano delivers an experience reminiscent of iOS, which is heightened by its swipeable touch screen and new Home button. Apple appears to be more cautious in this generation's nano to avoid any inadvertent suggestion that the latest iPod nano can run iOS apps. It's assigned the nano's functions distinctive round icons that initially make the device look like a knockoff product. The brightly-colored ball icons look like they weren't designed by the same team that crafted the sharp, distinguished look of iOS; they leave the device looking like it was intended for children. At the same time, the "app" features are all fairly adult: fitness and podcasts, but no games or anything really fun to play with. This gives the overall appearance of the iPod nano's user interface a sort of disjointed feel, as all of the menus within the playful, childish looking "ball" app icons are all serious, grey, minimal and utilitarian. There's few options for customizing colors or backgrounds (a few simple wallpapers, and all are color coordinated with the device's color). After some use, the simplistic ball icons start to grow more familiar. 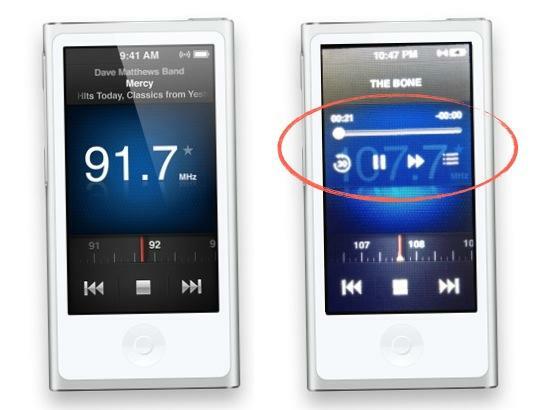 While some of the iPod nano's round app buttons borrow Apple's familiar icons (such as Podcasts, Radio and Voice Memos), others (like those for Photos and Settings) are more distinct from the company's usual graphics than those you might find on a typical Samsung product. Apple is clearly going well out of its way to make it clear that the iPod nano runs a different set of software, similar to rectangular box icons of Apple TV. Navigation between features is also a bit simpler. So, for example, from within an "app," you can return to the Home screen by flicking back to the left as well as clicking the Home button. Syncing with iTunes is also like a classic iPod rather than an iPhone. As soon as you plug in, you enter "do not disconnect" mode and playback stops until you finish the sync. Classic iPods are "taken over" when they connect, but they can also support "Disk Use," an optional feature that mounts them as a disk for copying files, but which also requires that they be manually ejected before being disconnected. It almost seems hard to believe that iOS devices have only had "PC-free" iCloud wireless configuration for about a year now, but of course conventional iPods are still tied to iTunes. There is no support for wireless iTunes sync over Bluetooth. And while the Bluetooth software seems to work well enough (we experienced no problems pairing to a car system), it seemed to be hampered by the iPod nano's aggressive power saving modes. Unlike an iPhone or iPod touch, after pairing to a vehicle (or Bluetooth headphones, or wireless speakers) you typically have to manually reconnect after the iPod goes to sleep, rather than having it discover the output device on its own and continuing to "just work." Once connected to a Bluetooth device, it's easy to switch between outputs by touching the Bluetooth icon that appears in the playback controls, which pops up a choice between the iPod nano's headphones, your vehicle's audio system, and any other configured devices. Also unlike iOS devices, the iPod nano also doesn't provide any support for contacts, calendar, notes or reminders, and can't sync up iBooks for reading (the screen is small, but it's plenty large enough for scrolling through notes or even ebooks). More surprisingly, there's no option for even basic games. Most of these features formerly got at least some support on older iPods. Depending on how the new iPod nano sells, it's likely Apple may expand its own software offerings for it, and potentially even open things up to third parties (as it formerly did in selling classic iPod games with limited partners). Dive into the "apps" and things become more familiar looking. Music playback by song, artist, album, playlist (including Genius Mixes), composer and genre (or Audiobook, Podcast or iTunes U) is closely reminiscent of iOS devices, apart from missing any connection to the iTunes Store or support for more advanced features like AirPlay streaming output and search. Podcasts are also available within Music, but Apple breaks them out as their own category for easy access. They work just the same as any other music or video files, they're just downloaded and managed by iTunes. The same applies to Apple's specialized iTunes U library of podcasts contributed by education organizations. 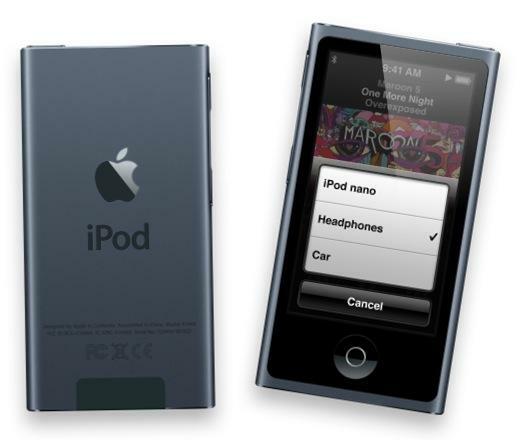 iPod nano is Apple's only device to include built-in support for FM Radio playback. It continues to support "Live Pause," which similar to a DVR, allows you to "rewind" through up to 15 minutes of the program you're listening to, or simply pause to take a break and then resume listening to a "tape delayed" recording of the program. You can't save recordings of radio programs. To bring up Live Pause features, you simply tap the screen and its playback controls appear (as shown above). Clicking on the list icon lets you access favorite stations (tap the star to set a favorite), or see Tagged and Recent Songs (features that identify songs while you listen for later shopping in iTunes). There's also an option to automatically find Local Stations. It's interesting that Apple developed the software for Radio exclusively for the iPod nano (and historically, for other iPods via a $49 accessory) but does not support the feature on its iOS devices (despite being equipped with baseband chips having hardware support for receiving FM Radio). However, the iPod nano also lacks the ability to stream Internet radio or content on demand via apps, download purchases from iCloud or buy new songs via iTunes. The iPod nano is also oriented to carry on a run or use during a workout, where having radio playback might be more useful, particularly when tuning into FM broadcasts of the audio of TVs in a gym. You must connect headphones for the radio to work, as they double as the radio's antenna. Under Videos it's easy to play back both movies (with chapter support), music videos or your own home movies, although the iPod nano has tighter requirements on the videos it supports. Technically it supports "H.264 video: 720 by 576 pixels, 30 frames per second; Baseline, Main, and High-Profile level 3.0," which means SD (standard definition) in iTunes. It will not play "HD" videos (720p or 1080p) from iTunes or HD videos captured by an iPhone (without manual conversion on your end); iTunes will simply complain that it can't sync them over if you try. It had no problem playing an iTunes SD movie with a greater resolution than its specified "maximum," but iTunes refused to sync over TV Shows that had been downloaded exclusively as HD videos. If you buy HD movies, iTunes generally downloads both an HD and SD version, and therefore handles the issue for you by syncing the appropriate version. Videos always play in the screen's wide orientation, although playback will flip over to display either way you hold the screen sideways. The overall user interface, in contrast, only works in the vertical orientation, and does not flip if you hold it upside down. The Photos app syncs in any pictures you specify in iTunes, including any Albums, Events and Faces. iTunes handles photo sizes for you via compression, but can be configured to also sync over full size pictures you can access from the device in Disk Mode, such as if you want to shuttle around photos to share. 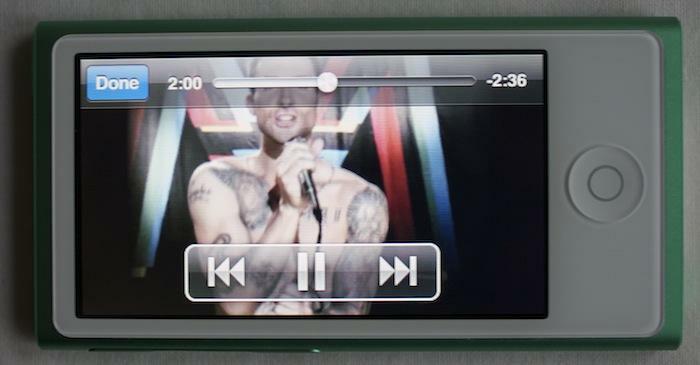 Like previous iPods, you can also play back slideshows of your videos, but there is no option for video output on a TV. 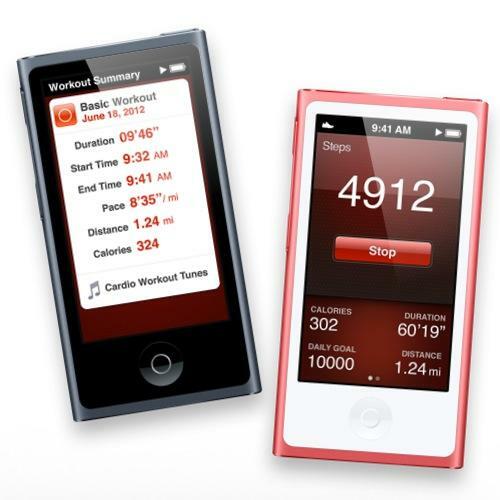 Similar to the full Nike+iPod app for iOS, the new iPod nano lets you track running workouts with Basic (open-ended), Time, Distance or Calorie goals. The Nike+ integration for tracking runs doesn't require a show sensor, but it can be configured to work with the Nike+iPod Sport Kit sensor, remote and heart rate monitor. The Fitness app also supports a step counter for walking, which will count all your steps in the background. You can then upload your regular walking activity to the free Nike+ website to monitor your progress and perhaps incentivize taking the stairs. Enter your weight and set a daily step goal, and the new nano will keep a calendar of your daily walking activity. While counting steps, a shoe icon appears on the top left of the iPod nano's screen next to the Bluetooth indicator. 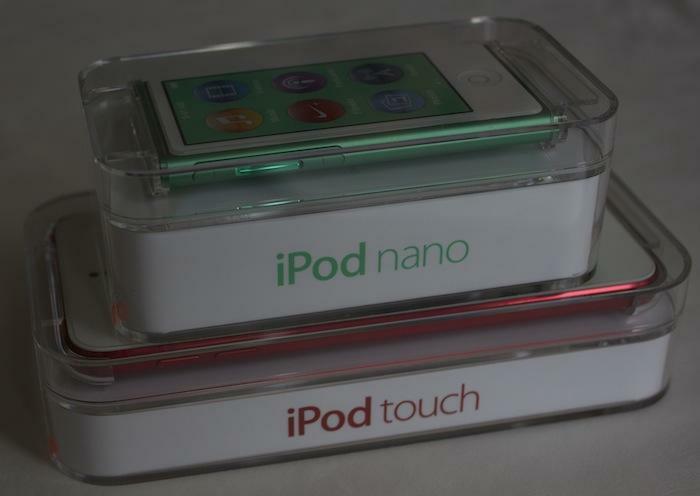 If size and portability are important, the diminutive new nano might be your favorite iPod. It's compact and sturdy, super easy to use, and weighs so little that it's hard to feel it in your pocket. It's the size and heft of a small pack of gum, and it's about as easy to figure out how to use it. It features insanely precision engineering, a very good quality display with a highly responsive multitouch screen, plays back glitch free audio and video at reasonably loud levels (although you'll need headphones as there's no built-in speaker), and introduces capable support for Bluetooth audio. 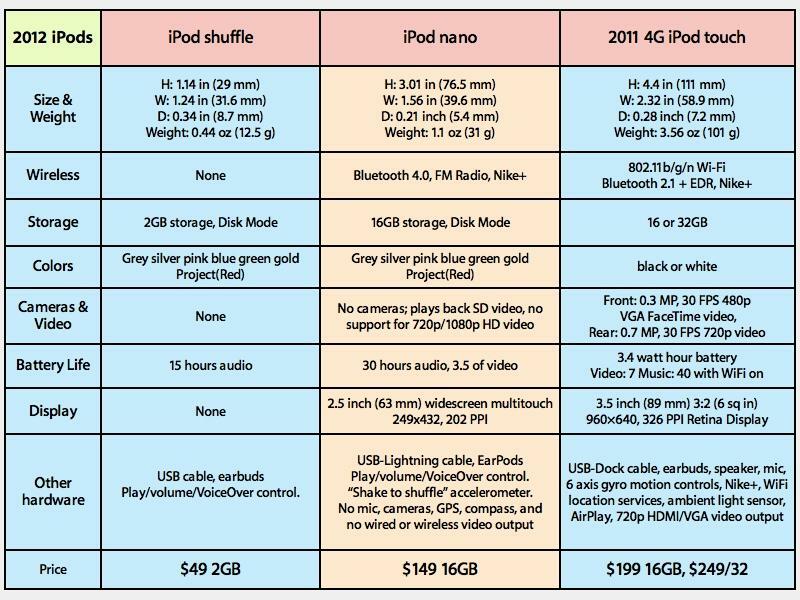 If you don't mind a larger iPod for $50 more, last year's fourth generation iPod touch provides a significantly more powerful device with WiFi and full iOS features including web, maps, email, messaging, FaceTime, iCloud, App Store games and other titles, iTunes and other Internet content, as well as cameras, a much larger screen and longer battery life. It is significantly larger, heavier and more fragile however, and lacks the nano's FM Radio feature. In the other direction, the iPod Shuffle is only $49 and is significantly smaller, but only holds 2GB of music and lacks a screen, radio, voice recorder, video playback, Nike+ and Bluetooth. The newest iPod nano isn't perfect. Its round ball icons seem poorly conceived and a bit too cartoonish; its Bluetooth works well enough but not quite as slick as the version available in iOS; and it's a bit of a bummer that Apple was too cheap to include a version of EarPods with an integrated mic. There's also no camera, speaker, USB wall charger or belt clip included, but it's not clear how useful a cheap camera would be. It'd be cool if it offered more customization, such as an option to display full color, professional looking icons or custom wallpapers. And its sort of sad that the new device packs a lot of nice hardware (multitouch color screen, Bluetooth) that can't be fully exploited by third party apps, in particular games. For $149, Apple could have included a bit more fun. It is, however, a better overall value and feature mix than previous iPod nanos offered, and will no doubt be popular this holiday season. There's also lots of potential for Apple to update its firmware and address most of its minor flaws.